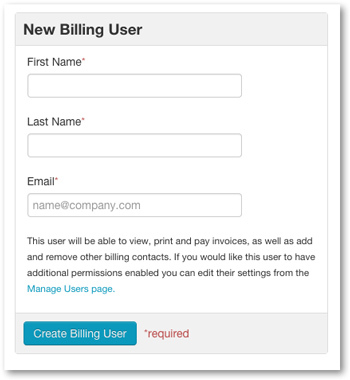 Follow the steps below to invite a billing contact to manage your invoices. Only Super Users can have the billing and invoices permission enabled. Please note: In order to be able to invite a billing contact to your 3Play account you must have the Manage Users permission enabled for your profile. Click Billing located in the upper, right-hand corner of the page. On the left-hand side of the page click on Billing Information. Click +New Billing Contact and on the menu that appears enter the billing contact's information in the required fields. After entering the Billing User's contact information click Create Billing User.